What time is it when you see 16 different six-foot tall watch sculptures created by the School of Visual Arts each celebrating a unique "A Moment in Time" lining Madison Avenue? 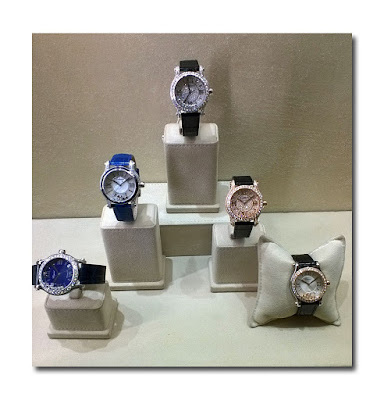 That means it's time for the 7th Annual Madison Avenue Watch Week, now through Saturday, May 13. As in previous years, this event showcases a "first look" at what's fresh from the 2017 Baselworld World Watch and Jewelry Show and the 27th Salon International de la Haute Horlogerie. 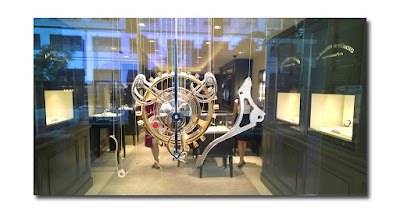 Yesterday, I and a few fellow bloggers took a tour along Madison, visiting many of the stores participating in watch week. These include: A. Lange & Söhne, Asprey, Chopard, David Yurman, De Beers, Djula, F.P. 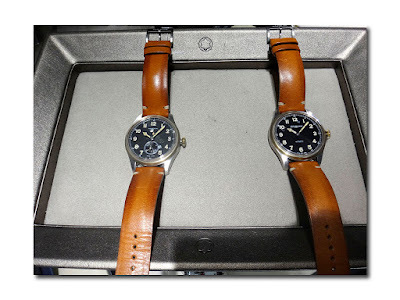 Journe, Georg Jensen, Hublot, Jaeger-LeCoultre, Montblanc, Panerai, and Vacheron Constantin. 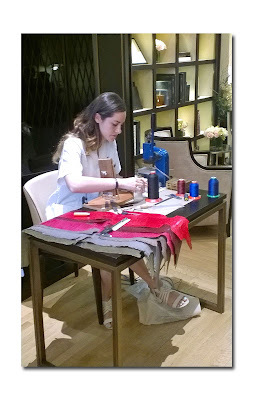 As in past years, Madison Avenue Watch Week will include artisan demonstrations; discussions with watchmakers; presentations regarding trends in design, manufacturing and mechanism technology; exhibitions of antique and historic timepieces and exclusive VIP sales appointments. For specific information on these events go to madisonavenuewatchweek.com. We began our tour, not with breakfast at Tiffany's but with breakfast at Mont Blanc where Sales Manager Christian Saccal showed us the Time Walker Collection based on the sport of racing. "We're going back to the sport watch style. The perforations on the rubber watch band go back to racing gloves," he said as he showed us the new limited edition 43 mm chronograph. Another watch in the series, the Chronograph Rally Time Counter can be removed from the band and used as a stop clock or mounted on your dashboard as a racing car clock. 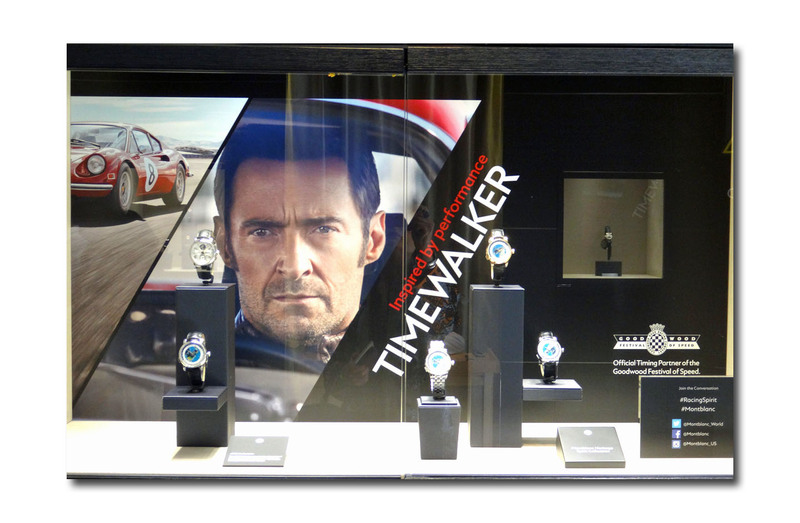 The Time Walker collection ranges from $3-7k. He also showed us the 1858 Montblanc, a 1930's stitching style once used to fortify the strap as well as a tan leather band that will age to a patina giving it a vintage appeal, which Saccal says is for a "very specific clientele." On the back is an etching of Montblanc's Minerva factory. 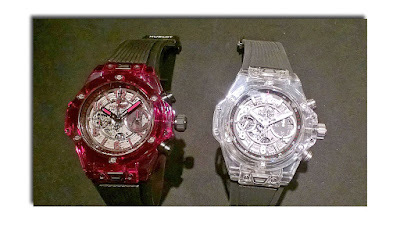 We proceeded on to Hublot, a newer kid on the block but one that packs a lot of punch in their designs. The store even smells amazing with some sort of a spicy exotic cinnamon aroma.. Here we saw the Berluti leather collaboration in green and blue leathers, the truly spectacular Magic Sapphire watches featuring clear or red sapphires from the Big Bang collection with the Unico in-house movement (The clear one is $57,900, while the red one is priced about $10,000 more). We also saw the more affordable Meca (short for mechanism) watch which has a 10-day power reserve. The titanium version is $19,900 while the Hublot gold (a patented 18k and ceramic mix which never scratches) is $34,600. Lastly we saw the Song Blue produced in collaboration with Swiss tattoo artist Maxim. At Chopard I focused on the ever popular Happy Diamonds. 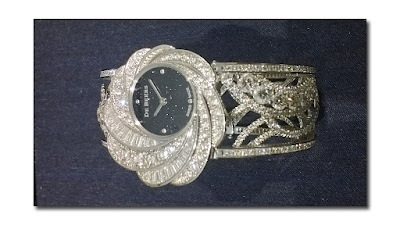 Interestingly, the collection began in the 1920's with an old school TV-shaped watch with floating diamonds on the face. A Middle Eastern gentleman designed and wore it however it has since been adapted by women. 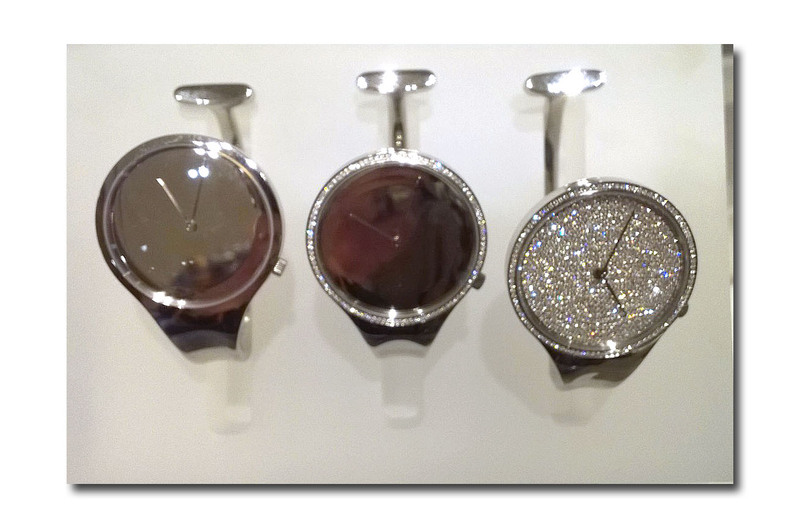 More bling-y women's watches were on display at Georg Jensen with the Vivianna collection. We were told that the open design of the band was so that "a woman could be freer with her time." In 1962, when this watch was first introduced it was extremely avant-garde however the design has become a classic. I actually own one of the unembellished watches of this style. 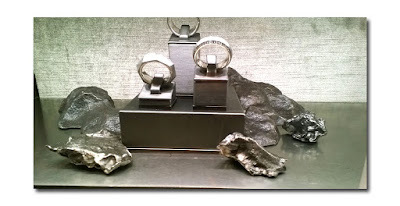 David Yurman Meteorite Collection with Actual Meteorite. Although David Yurman is not known for its watches, they do have a few unique offerings. We were shown the meteorite collection featuring an inlay on the face from an actual meteorite in Namibia, Africa which was purchased by Evan Yurman, David's son. There are only six made -- make sure you check out the upstairs display case for a piece of the actual meteorite! More ladies watches and naturally, more diamonds are the thing at De Beers, which recently moved from Fifth Avenue to Madison. The Aria Collection (meaning "Air") ranging from about $40k for a diamond "flowered" model, some with blue hand carved aventurine faces giving the look of more diamonds(!) to the exquisite bangle cuff model at $152k which is almost sold out -- only the larger size is still available. All of their collections are limited edition and are never reproduced. 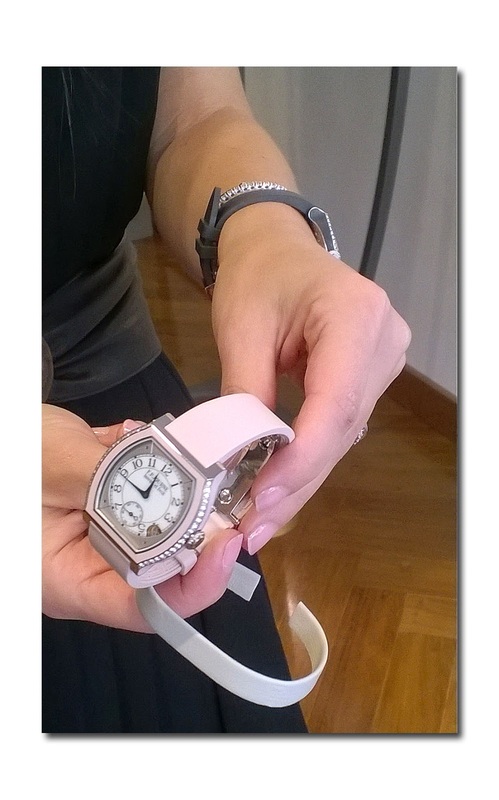 At Vacheron Constantin we witnessed a woman from Jean Rousseau making custom made straps. Their latest collection is their sportiest watch to date (they're mostly known for more "gentlemanly" watches) called the Overseas World Time Collection. It features straps which you can switch out yourself from metal, to rubber, to alligator. The brand will be hosting Leslie Kobrin, their newly appointed first female president who is coming to them by way of Van Cleef & Arpels. F.P. 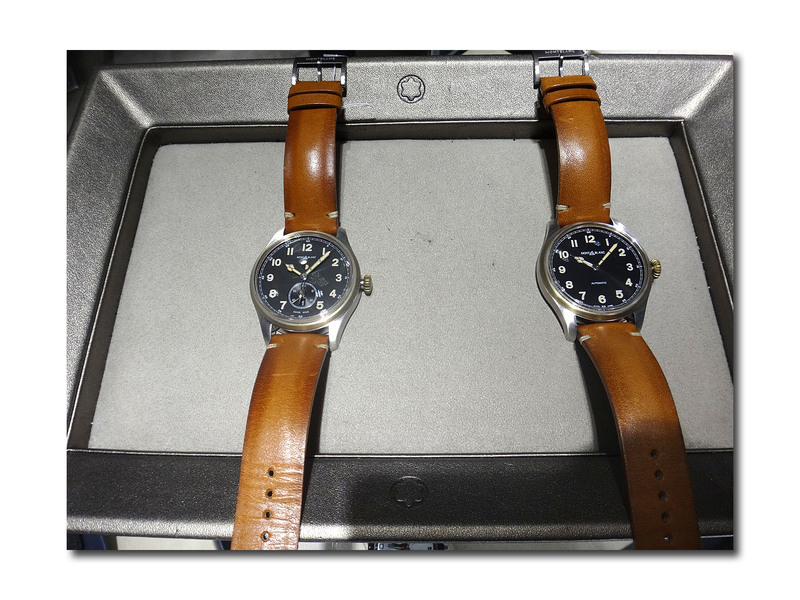 Journe has a watch collector's dream in their Invenit et Fecit collection of three watches. They were issued one at a time -- those who own one already given first dibs on buying the next one in the collection when they came out. They are basically sold out -- apparently the owner has his own watch on display but it is not for sale. For women, they have the Elegante which "goes to sleep" to conserve battery power however when you pick it up it snaps back into action with the correct time and date. The newest addition to the collection is in a light Millennial pink. My last stop for the day was at A. Lange & Sohne where they offered us beer and soft pretzels upstairs in their cozily furnished "Langhaus." 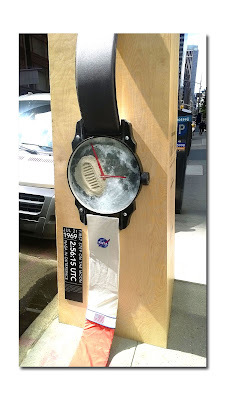 We were shown a chronograph women's watch which featured a window of blue skies during daylight hours and at about 6 p.m. the first stars begin to come out until at about 9 p.m. when the whole sky is dark and star filled. I asked if they had a Daylight Savings Time edition that would shift the sky darkening scenario back a few hours for the summer months but apparently not yet. Be sure to check out the SVA sculptures along the way for their beautifully done giant watch recreations including one commemorating the Moon landing, the first Margherita Pizza in Italy, the opening of Ellis Island, the first color television, the legalization of gay marriage, the Wright Brothers first flight at Kitty Hawk, NC and others. I would like to personally congratulate you as your blog Daily Fashion Report has been selected by our panelist as one of the Top 100 New York Fashion Blogs on the web.